by Jeanette Winterson | Other | This book has not been rated. The Passion is a modern classic that confirms Jeanette Winterson's special claim on the novel. Set during the tumultuous years of the Napoleonic Wars, The Passion intertwines the destinies of two remarkable people: Henri, a simple French soldier, who follows Napoleon from glory to Russian ruin; and Villanelle, the red-haired, web-footed daughter of a Venetian boatman, whose husband has gambled away her heart. In Venice's compound of carnival, chance, and darkness, the pairi meet their singular destiny. 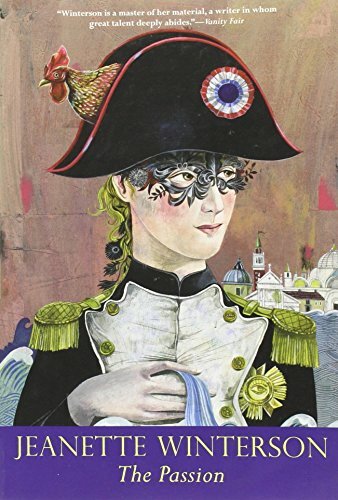 A magical, wonderful novel about the destinies of Napoleon's faithful cook and the daughter of a Venetian boatman. You will not soon forget this reading experience. The writing was good, but I honestly have to say the story really didn't capture me. I so wanted to like this book, too. But I am sure there is a reader who will adore it out there. May the fates of BookCrossing bring the right reader to this book! Bringing with me to today's meetup at Muddy Waters. See you there!